Dream come true: Rahman has been wanting to start a conservatory like this for close to 10 years. The heart of the KM Music Conservatory in Chennai is a large, quite bare room on its first floor. There’s a couch lurking by one wall, and a smattering of chairs, but the room’s focus is a piano floating off-centre. On or near this piano, the Conservatory’s students rehearse through the day, the music flowing up and into the building’s arteries—its air-conditioning ducts—like warm, life-giving blood. Sitting in a little office off that central room, Joshua Pollock hears the music and smiles. “It’s like that almost all day," he says. “I’ll walk by at 9pm and I’ll see people playing, or helping each other out. I’ve never seen anything like it in the West." Pollock is the Conservatory’s violin instructor, one of the six startlingly young, freshly graduated teachers who have been recruited from music schools overseas to fulfil a long-harboured yen of A. R. Rahman. “To start a conservatory like this has been his dream for close to 10 years now," says V. Selvakumar, managing director of the KM Music Conservatory (what the initials “KM" stand for is Rahman’s own secret. “He won’t even tell me!" Selvakumar says). The Conservatory aims to offer (for the first time in India, its brochure claims) training courses of collegiate intensity in not only Western classical music but also in music technology and audio engineering—which is where Selvakumar comes in. “People today still think that it’s risky to be a professional musician, so there’s very little advanced training available at a wide level," Selvakumar says. “The Trinity College courses are there, but only up to a level that students in the West attain even while they’re in school." As a result of that, and also because of the increasingly electronic nature of most compositions, Rahman sensed a decline in the quality of live music. “Every good violinist around today, for example, is from his dad’s generation," Selvakumar says. “The culture of the classical orchestra has declined in India. Maybe Zubin Mehta could have revived it, but he has orchestras abroad," Rahman says. “People have started thinking that the synthesizer can take over for the orchestra. But that’s just not true." It seems like an odd observation from Rahman, the man who pushed Indian film music into the electronic age, and who once said that the electronic synthesizer was his favourite instrument. His scores are characteristically as layered as bebinca, with a dozen different sounds baked seamlessly together in the oven of technology. Indeed, Rahman’s own global fame rests very much on his capacity to create music that merges Indian and international influences without compromising on quality—fusion that sounds organic and natural, rather than contrived and slapdash. And that ability, Selvakumar says, comes from Rahman’s strong classical foundation, the sort of foundation that many musicians lack today and that Rahman wants to provide at the Conservatory. Jyoti Nair Belliappa, the Conservatory’s administrative officer, reads an even longer-term goal into the establishment. “His main desire is to create a full-fledged symphony orchestra here in Chennai, with his own musicians," she says. “So, for instance, we’re encouraging students to take up the violin, because you’ll need at least 24 violinists for that kind of orchestra." The lack of an Indian symphony orchestra has hit Rahman every time he has needed to travel abroad, to London or Prague, to record a film score. “Even Iraq has an orchestra!" he exclaims. “I’d always think: ‘Why can’t this happen in India?’ But being an introverted composer, I thought I should just do my job and somebody else would start one." Nobody did, of course. “I kept hearing rumours—that a corporate house was starting an orchestra, that kind of thing," Rahman says. “Then, when nothing happened, I decided to give it a go myself." By his estimate, KM Music should be able to produce the core of a full-fledged orchestra in three years. Considering what a longstanding dream it was, the Conservatory seems to have gotten off the ground solely in a monumental spurt of adrenalin. In the first few days of 2008, Rahman and Selvakumar began seriously discussing the idea of this institution. “Everybody said we’d need at least two years of planning," Selvakumar says. “But if Rahman wants something, he wants it now." Barely a couple of days later, on 6 January—Rahman’s birthday—a press release was drawn up. Seven months later, the first batch of students—48 full-time, 50 part-time—began their foundation year, which can be followed by a three-year bachelor’s degree. Every one of them was auditioned; one girl even sang over the phone. “There had to be a challenge, after all," Selvakumar says, grinning. But certain challenges become easier if you are A. R. Rahman. Temporarily, the Conservatory lives today on various floors of two buildings owned by Rahman, a couple of streets away from his studio complex in Kodambakkam. The bigger of the buildings, renovated just a month-and-a-half ago, has a large classroom on each of the three levels, with little hutch-like practice rooms scrunched off to one side. All investment in the KM Music Conservatory—equipment, hiring, the upcoming development of a larger, permanent campus—is Rahman’s as well. Rahman himself will not teach much; rather, he will hover over the institution as its benign founder-principal. “He comes around now and then," says Shasta Ellenbogen, a faculty member. “He was at the Faculty House the other day, to watch television with us. He’s almost absurdly normal for somebody who’s so famous." Every member of the faculty joined the Conservatory, Selvakumar says, solely because of Rahman’s reputation and influence. But that isn’t entirely apparent at first. Perhaps because of the breathless clip at which the Conservatory was conceptualized and set up, the faculty consists largely of graduating students from other music schools, running a narrow gamut of ages from 20 to 27, all looking for interesting opportunities. “If I hadn’t come here, I’d probably have been holding down some sort of boring job, like being a receptionist at a dentist’s office, and doing auditions on the side," says Kavitha Baliga, who graduated with an MA in vocal performance only a few months ago from the Boston Conservatory. “This is a dream for someone coming out of college, to teach immediately like this." But Michael Lindsey, the 22-year-old, ear-ringed drum instructor at the Conservatory, points out that being a fresh graduate doesn’t necessarily imply a lack of teaching experience. Even when he was working towards a BA in musical performance at DePaul University in Chicago, Lindsey taught private students on the side. “I’ve taught, in one form or another, for six years now, and that’s true of a lot of others here." Rahman has a more irreverent way of saying the same thing. “These guys have been learning music since they were nine or 10 years old, or even before that," he says. Then, with a grin, “Really, they’re as good as the oldies." Maybe it’s just as well, though, that the focus of the first year’s curriculum revolves so much around a basic concept: the Western notation. “I learnt to read notation before I learnt to read words," Baliga says. “I can’t imagine being at this age and learning it from scratch. It’s very difficult." But it has to be done. 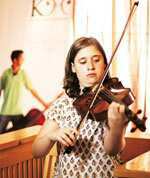 Ellenbogen, the 20-year-old viola instructor, observes that Indian classical music emphasizes the aural over all else. “The kids here, they’re all great at memorizing a piece, or picking it out by ear, so they don’t see the need to read," she says. “It’s like they have to learn this new language by immersion." The teachers are all on 10-month contracts, and most plan on staying for two years, but Pollock sees KM Music’s dream as an evolving organism. “To fulfil the goals of this school, it’ll take a generation or two," he says. “But I’m so interested in seeing how Western classical music will take root in this environment. It won’t survive unless people make it their own in some way. I want to see how that will happen." 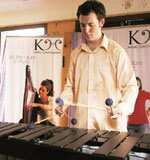 A lot of people think that percussion consists of just banging on drums," Michael Lindsey says. But there are subtleties, and Lindsey is teaching them at KM Music to students of both the Western drum kit as well as Indian percussion instruments such as the tabla and the mridangam. Lindsey came to Chennai first in December 2006, when he was 20, to study the tabla and Carnatic music. At the time, he was halfway through his undergraduate degree in music performance at De Paul University in the US. “When I was wrapping up my degree, I’d applied anyway for grant money to study at the University of Madras," he says. “But then this came along." Lindsey got in touch with Rahman through a friend’s friend in the beginning of May, and they proceeded to email each other back and forth for three months before Lindsey was told that he had the job. One of the youngest teachers at the Conservatory, Lindsey is a lanky young man with a full head of curly hair and multiple earrings. He sees himself staying in India for “probably two years or so. Then I’ll head back to the US for my master’s degree". At KM Music, Lindsey has five students, three of whom have played the mridangam before. “But none of them have the classic drumming technique, so I’ve had to teach that first," he says. “They can play along fine with Carnatic music, so it’s just a matter of transferring that skill to Western notation." I n London earlier this year, Joshua Pollock stepped out of the Underground and found that his cellphone had registered a missed call. “I called back, and it turned out to be A. R. Rahman," Pollock says. “He was calling to ask if I’d come over to his house to talk about my teaching position." Pollock is 29, and for the last three years he has been “agonizing" about how he could build a life in India. “I visited here in 2005, and I loved it so much that for the first time I was insecure about what I wanted and how I could get it," he says. When he found a press release online, announcing the launch of KM Music, he sent in his CV and recordings. And then he sat back and waited for Rahman to call. Originally from Maine, US, Pollock completed a double master’s in music and musical performance at the Guildhall School of Music and Drama in London. “When I mentioned I was coming here, there was like a snowball effect," he says. “More people applied, and another person actually signed on. People can often be afraid of exploring new frontiers, but when somebody else is doing it, that makes it easier." Pollock is a performer at heart, which may make his move to India—with its still-nascent circuit for Western classical performances—a little difficult to understand. “But you know, ever since I can remember, I’ve always wanted to teach the violin and perform," he says. “Where I did that wasn’t so important." In their move to India, the other teachers at KM Music had it easy—either they brought their instruments with them, or they picked up new ones in Chennai. But that isn’t quite as straightforward when your instrument is a whacking great harp. Ten days after arriving in Chennai, Alison Maggart’s hands were positively itching. “In 17 years, I’d never gone this long without playing, and it proved really hard," she says. A harp was ordered from a company in the US, and until it got there, Maggart had to sit on her hands. “I borrowed a Celtic harp, a small one, from somebody here, but it just wasn’t the same." Maggart, 22, graduated from Middlebury College in Vermont, where she studied for a liberal arts degree with a specialization in music. “The syllabus included some classes in film studies, so I had heard of A. R. Rahman, and heard some of his film scores," she says. When Maggart applied for a music fellowship after college, one of her interviewers, Cleveland Johnson of De Paul University, suggested that she might want to apply to the KM Music Conservatory as well. The application took a while. “My family’s really conservative, so I needed all the details lined up perfectly, like where I’d stay and so on," she says. Teaching the harp is only a part of Maggart’s profile. She also assists Rahman in his studio, and she is pitching to take a class on the history of listening as well. “Students here are very often not used to the sound of Western classical music," she says. “I’d want them to learn why a particular piece of music is good, and frame that discussion in a cultural context. I think that’s a very important part of the overall process." W hen he was a boy and just beginning to learn the organ, Robert Koolstra’s teacher set down a difficult score one day and challenged him to play it. “It took me two weeks," he remembers. “But I did it, and the challenge made it interesting for me. It motivated me to learn." Koolstra, 29, is now translating that approach into his own teaching at the KM Music Conservatory, where he heads the western classical music department and gives piano, harpsichord and composition lessons. “When we began teaching notation here, we realized that it’s hard to find a book that makes notation interesting for adults," Koolstra says. “So because we had to make it fun, we graduated from the basic text to a much more difficult book. The students got a kick out of being challenged that way." Koolstra, originally from the Netherlands, came to KM Music from London’s Guildhall School, where he majored in harpsichord performance at the postgraduate level. His classmate—and now his colleague—Joshua Pollock had pointed out an emerging conservatory in India, and Koolstra was hooked right away. Keeping his performance skills alive, Koolstra often flies to Europe to give concerts, fitting in his recitals between lessons at KM Music. It is important, he says, for students to have teachers who perform, and can bequeath that particular wisdom to their wards as well. “You know, Joshua and I had spoken so often about how we wanted to be part of a new school, where we’d have some say about what to teach and how to teach it," Koolstra says. “We’d even talked about founding our own school some day, so when we heard about this, it was exactly what we wanted." It wasn’t so much that India drew Shasta Ellenbogen as that Europe drove her away. After two years at the Amsterdam Conservatory of Music and a third at London’s Guildhall School of Music and Drama, Ellenbogen began to find Europe, in a word, boring. “It all began to feel like variations on the same theme," she says, the musical allegory quite unintentional. 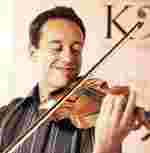 Then, more emphatically: “In Europe or the US, I would have been one among a mess of viola players. Then it gets to be about whose bum you kissed. I’m not one to play at that game. Western classical music has become one giant cliché in the West." Resemblances to a world-weary veteran notwithstanding, Ellenbogen is only 20. At KM Music, she is part of a team that teaches music theory, and she has two viola students taking individual lessons from her. “The viola isn’t very popular in India as yet, but that’s part of what KM Music is trying to do, to change the infrastructure and the way people learn." Her biggest teaching challenge thus far, she says, has been to get her students to think “in a Western sort of way". “I just had a long talk with them yesterday, to explain how music was a discipline, just like being a doctor or a lawyer," Ellenbogen says. “They have to think of it in a more analytical, bap-bap-bap sort of way" and here she forcefully karate-chops the side of one hand on her other palm three times, for effect. But isn’t music just as much of a discipline in India as it is in the West? “I don’t think it is as regimented," Ellenbogen says. “That’s not in their mentality. It’s still a little too airy-fairy for me." Some of the teachers at KM Music went through many months of applications and correspondence before they landed their positions. Kavita Baliga did it in 10 days. “At some point, I’d done a concert with the guitarist Prasanna, which was so much fun, and later I found out he’d submitted my name to K. Selvakumar for a faculty position," she says. “It happened so fast that, within a week-and-a-half, I was here." Baliga, at the time, was a newly-minted graduate of the Boston Conservatory, where she got her MA in vocal performance. Being the only imported teacher of Indian origin, Baliga admits that the Rahman name was a big draw. “I grew up listening to him," she says. “His music was always such a big part of the Indian community in the US." Only when she arrived at KM Music did she realize the scale of the task. “Some of the students hadn’t heard any sort of Western classical music at all before, and many of them found it difficult to depart from the Indian techniques they’d learnt." Baliga then plunged into an intensive four-day-per-week schedule, teaching big classes but also conducting the choir and giving one-on-one voice lessons. Baliga revels in the freedom she’s been given to frame her own syllabus. “I thought I’d start, in the first year, with some early Baroque English music before moving on to Italian or French, because it’s easier to start with a language you already know," she says. “Right now, though, it’s still basic exercises and notation and approaches to practice. They need to learn that first."